Savtira Corporation, who provides outsourced Cloud Commerce solutions, has chosen Dell DCS’s PowerEdge C line of servers and solutions to deliver streamed media and apps from the cloud. 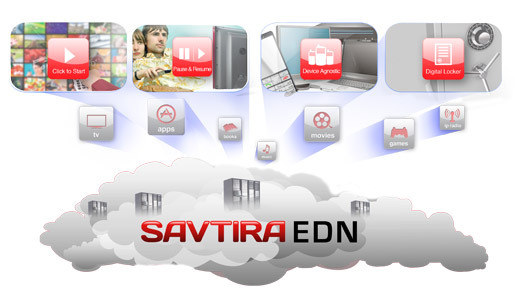 Dell’s gear will help power the Savtira Cloud Commerce platform and Entertainment Distribution Network (EDN). With a little help from PowerEdge C, businesses will now be able to use EDN to stream all digital media (business apps, games, music, movies audio/ebooks) from the cloud to any device. One of the particularly cool features is, since the state and configuration are cloud-based, consumers can switch between devices and pick up exactly where they pushed pause on the last device. To power Savtira’s EDN data center, the company picked PowerEdge C410xs packed with NVidia Tesla M2070 GPUs and driven by PowerEdge C6145s. If you think GPUs are just for rendering first-person shooters, think again. GPUs can also cost-effectively supercharge your compute-intensive solution by offloading a lot of the processing from the main CPUs. According to NVidia, for 1/10 the cost and with only 1/20 of the power consumption, GPUs deliver the same performance as CPUs. To help you get an idea of the muscle behind this solution, the PowerEdge C410x PCIe expansion chassis holds up to 16 of the Tesla M2070s GPUs, each of which exceeds over 400 cores. Two fully populated C410xs are in turn powered by one PowerEdge C6145 for a combined total of 33 Teraflops in just 7U. This entry was posted on Monday, April 18th, 2011 at 8:38 pm and is filed under Uncategorized. You can follow any responses to this entry through the RSS 2.0 feed. You can leave a response, or trackback from your own site. Hey…that’s my customer! Look for a video on my blog soon!